Use the following steps to determine whether the AC adapter is working properly. Step 1 – Examine the adapter, power cord and computer for physical damage. Check the AC adapter and cords for physical damage such as fraying or cuts. Also examine the power adapter for signs of damage or overheating. Check the DC connector pin on the computer to ensure that the pin is not bent or broken. If the pin is broken, contact HP for technical assistance. Check if there are no obstructions or any foreign material inside the DC connector. Check if center smart pin is straight and not slanting inside the DC connector. 1,Unplug your AC Adapter from the wall outlet and plug in a small lamp or other device that you know is working fine. 2,If you’re using a power strip, follow the same directions as in the last step for your power strip. 3,If any of the wall outlets are not providing power then test the lamp or other device on a different wall outlet. Remove and reconnect the power cord from the AC adapter. Reconnect the power cord to the AC adapter. Be certain that the AC cable is fitted tightly in to the AC adapter inlet. CAUTION:Adapter may shutdown and remain without output due to conditions that can trigger Overcurrent, Overtemperature, and Short circuit. To recover the adapter output, unplug the adapter from the AC inlet for approximately 5 seconds and plug again. 1,Remove the primary (and secondary) battery from the notebook PC. 2,Plug the AC adapter directly into a functioning wall outlet. Do not plug into a power strip, surge protector or secondary power source. 3,Verify that the LED on the AC adapter is lit when plugged into an AC wall outlet. NOTE:Some AC power adapters do not have an LED. 4,Connect the other end of the AC adapter into the computer. 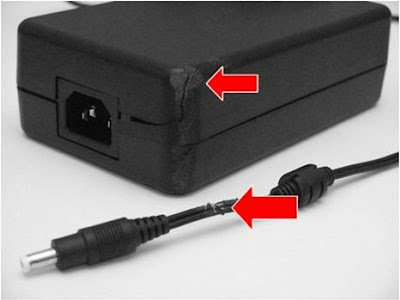 5,Verify that all power cord connections are secure. If the AC adapter connection to the notebook is loose, the connector or system board may be damaged and require repair. Contact HP service and support for further assistance. If the AC adapter is defective and the computer is in warranty, contact the manufacturer. If the computer is no longer in warranty, Ordering an Replacement AC Adapter . NOTE:On some HP notebooks, the LED lights do not indicate a power state. For other HP notebooks, there may be multicolor LEDs that do indicate different power states. To determine the functionality of the LEDs on the notebook, please refer to the user guide which came with the notebook. With the AC adapter connected, look for any LED lights on the front, top or side of the notebook PC. If an LED light is on then the AC adapter is functioning properly. Some notebook PCs have a power indicator light in the area near power connector. If this light is on then the AC adapter is functioning properly. Windows will indicate if the AC adapter is working properly by changing the battery icon in the system tray. 1, check the battery icon. 2,With the AC adapter connected to the PC, the battery charging icon indicates that the AC adapter is working properly and has enough power. If the AC adapter is defective and the computer is in warranty, replace the AC adapter with the appropriate spare part. If the customer needs a replacement AC adapter and the computer is no longer in warranty, Ordering an Replacement AC Adapter . 3,The AC adapter does not have enough power to charge the battery and provide power to run the notebook PC at the same time. Instruct the customer to use the power adapter that came with the notebook PC for better performance. If the customer needs a replacement adapter, replace another ac adapter.